Welcome to our tenth installment in our Transformation Tuesday series! 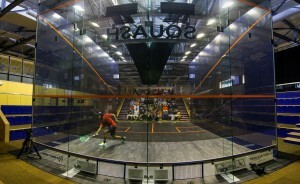 This month, we'll be taking a look at the McArthur Squash Center at the Boar's Head Sports Complex! 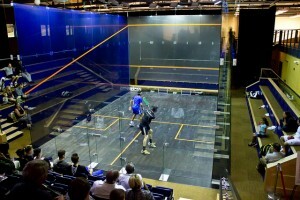 This state-of-the-art facility serves as the home base for the University of Virginia men's and women's squash teams. 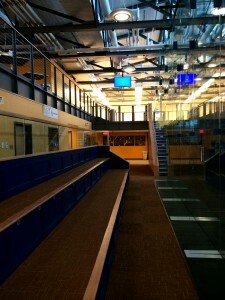 The center features eight singles courts, two doubles courts, and one glass-walled feature court with stadium seating for almost 400 spectators. We were asked to provide an integrated audiovisual system to allow the space to be more adaptable and easier to use. We were able to transform the user experience of the facility using a variety of new tools! We implemented an iPad-controlled score-keeping system for referees. We installed monitors at each court, all controlled by local iPads that allow one to set up a timer for an exercise, pull up a YouTube video for reference, receive updates on upcoming events, et cetera! We also installed cameras in five of the courts and used the Crestron Capture HD Recorder to allow live streaming both online and to monitors around the facility. Welcome to our ninth installment in our Transformation Tuesday series! This month, we'll be looking at an event that we worked on with the Virginia Athletics Foundation! The Celebration of Champions event in October was held to honor the foundation's donors, and gave donors a chance to mingle with student-athletes who were current recipients of these scholarships. For this event, we were tasked with creating an interior treatment for a tent placed in the southern section of the Lawn at the University of Virginia. Take a look at how we transformed this tent using projection, a spandex divider, colorful lighting, and some fun architectural panels from Atomic Design!